After reading a tweet from my Twitter stream from @SamsungMobileCA this morning, which asked you to retweet for a chance to win tickets to Lady Gaga’s Born This Way Ball in Vancouver. Since I wanted to see her in concert again, and never did get any tickets, I thought what the hell. I had nothing to loose and only good things to gain. I was super excited when I got a response from them on Twitter letting me know I had won tickets to her show on Saturday. I can hardly wait to see her again in Vancouver. She puts on an amazing show and this monster is excited. Do you want to get your hands on the new Samsung Galaxy S Fascinate 4G from Telus? Do you use Gowalla? Well on Thursday May 12,2011, Samsung will be giving away 10 Galaxy S Fascinate 4G smartphones in Toronto, Montreal, Calgary and Vancouver at a secret location in each city. All you have to do is be one of the first 10 people to check-in via Gowalla at the mystery Telus store location at the city. If you are one of the lucky 10 people, you will get a notification telling you that you’ve won. Also if you are not one of the lucky first 10 people, you can still enter to win a Galaxy S Fascinate 4G smartphone with $4,000 cash between May 12 – May 26. Google Maps Navigation providing turn by turn voice guidance and new Google Maps in 3D. Available only on Android. For Vancouver, I’ve been told the secret location. Now I haven’t been told I can’t tell you which store it will be, but just in case I’m not allowed, do know that it’s located at one of the downtown malls 🙂 You can visit the Telus kiosk in Pacific Centre Mall starting at 10am tomorrow. Are you tired of the cold rainy weather in Vancouver? Are you tired of the lack of sun and want to escape to warmer climates? Well the Weather Network wants to give you a sunny all inclusive vacation to the Mayan Riviera for 2 courtesy of TakeOffEh.com. 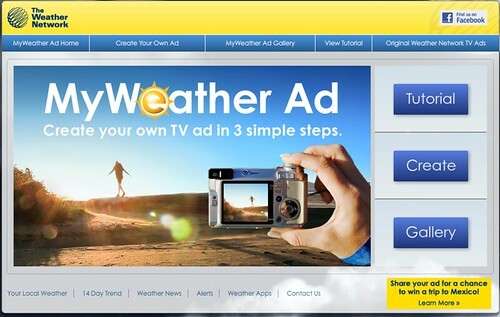 All you have to do to win this lovely vacation is to make a Weather Ad lasting 30 seconds at MyWeatherAd.com. share your ad with friends and family and have them “Like” your newly created ad. The ad with the most “Likes” wins. Show Canada how creative you can be and create as many ads as you like, but you have until March 21st, 2011 to enter and get your ads “Liked”. Further information about The Weather Network and MyWeather Ad is available at theweathernetwork.com and The Weather Network’s Facebook page www.facebook.com/theweathernetwork. 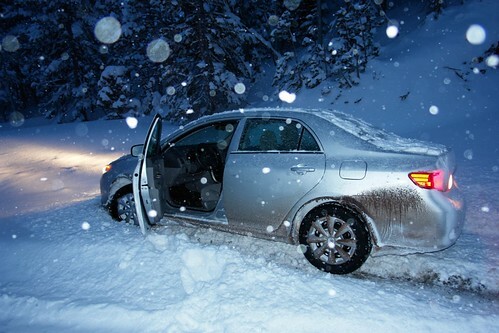 With this past weeks snow storm through the central US and through Eastern Canada, how prepared are you should you find yourself stranded in a winter storm? Have you ever been stuck or stranded on the road? The Community Against Preventable Injuries (Preventable) wants to hear your story and you can be entered to win an emergency roadside kit. We might not always think of winter driving here in Vancouver, but for some of you who ski or travel into the mountains are you prepared for being stranded should snow conditions change? For me, coming from Ontario, I’ve always made sure I had some essentials in my car. I made sure I had a least a blanket and candles. Yes not a full stock of essentials, but I was more prepared than some. I’ll be drawing for this on Thursday February 10th at 5pm. For more details, please check out Preventable’s offical rules. Thanks to all who participated for this great price from Preventable. The winner, after asking for a quick random number. Thanks to @OLMMark for choosing this winner – Brian Paterson. We’ll have someone contact you in the next couple of days. Welcome to my very first ever contest! Are you excited, I’m excited and I’m smiling about it! As we all know the holidays are always a time for merriment and good cheer. And what shows off that cheer more than a wonderful smile. 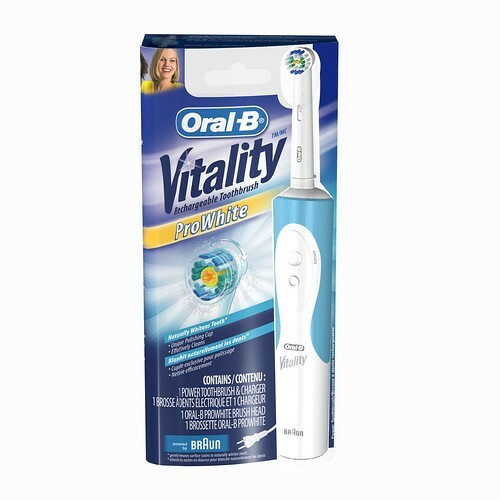 The folks at Oral-B have been kind enough to offer one lucky reader not one, but two Oral-B Vitality ProWhite® power toothbrushes to help you show your loved ones how important their smile is. The Oral-B Vitality ProWhite cleans and naturally whitens teeth by removing surface stains and more plaque than a regular manual toothbrush – and it’s patented brush head with polishing cup is inspired by the tools dental hygienists use. What I’m asking my readers is to answer a simple question – What makes you smile over the holidays? You can leave me comment here or tweet me a response and tag it with #oralb. One lucky winner will win 2 of these awesome power toothbrushes. Each comment and/or tweet is one entry into the contest. I myself use the Oral-B power toothbrush and swear by it. So think long and hard, but not too long as this contest will end on December 5th, 2009 at 12 noon PT. *This contest is open to Canadian Residents only. UPDATE: And the Winner is!!!!???? – Raul Pacheco!! Congrats! Russ picked a number randomly and you are the lucky winner!